World Leaders, Hip-Hop Peers Celebrate Nipsey Hussle's Life In Los Angeles On Thursday, Los Angeles celebrated the life of the rapper Nipsey Hussle, who was murdered on March 31 there. Rapper Nipsey Hussle, photographed in Atlanta on Dec. 10, 2018. Nipsey Hussle was a lot of things in life: a son, brother, father, a rapper, an owner, an inspiration. In an industry where hood cred is everything, Nipsey Hussle was a credit to his hood. They called him Neighborhood Nip in South L.A.'s Crenshaw District, and on Thursday — about a week-and-a-half after he was gunned down in front of the Marathon Clothing store he owned in that same hood — his life was celebrated in perhaps the largest public memorial a hip-hop artist has ever received. 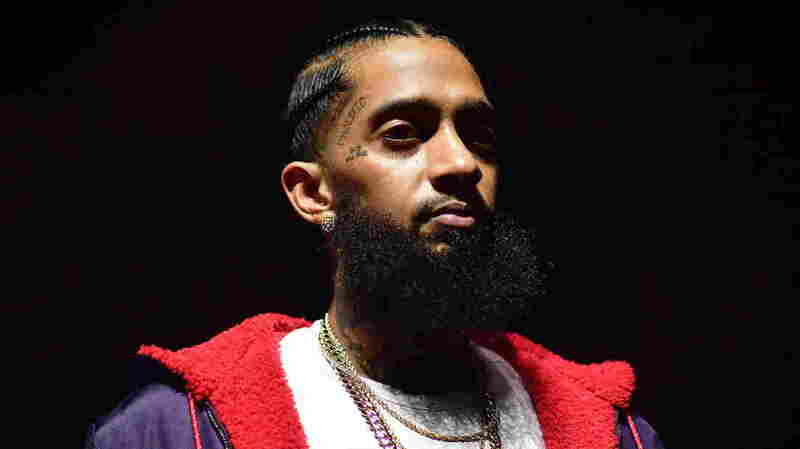 But it was the words from family and friends — including Nipsey Hussle's mother Angelique Smith, brother Samiel "Blacc Sam" Asghedom, longtime partner Lauren London, as well as industry peers and collaborators Y.G. and Snoop Dogg — that resonated. "Yesterday we witnessed the power of emotion, and the importance of coming together as one city family united in one mission," Chief Moore posted on Friday. "For those that knew Nip personally, you know he had love for every gang member in Southern California — no matter what neighborhood you came from," Snoop said from the podium of the Staples Center, acknowledging how Nipsey Hussle's success and community service transcended his gang ties and served as a point of pride for rival and allied Blood and Crip factions alike. In the days since his death, Nipsey Hussle has served as a rare beacon of solidarity for many who lived the struggle he represented and rose above in South L.A. Footage of a peaceful "Unity Walk" that took place at his Marathon Clothing store on Apr. 5 spread across social media. "He built something and people are coming and paying homage like a Mecca ... from all over the world, all over the country," his brother Blacc Sam said during the memorial service. The memorial's program featured remarks by Kendrick Lamar, Issa Rae, Michael B. Jordan and LeBron James. Members of Hussle's immediate family, including his mother, father, brother and sister, spoke as well as members of his hip-hop family. His partner London held back tears while speaking at the podium. "I love you beyond this Earth. And until we meet again, the marathon continues," London said. The intersection that he invested so much into as a businessman who believed in economic empowerment, has been named in his honor: Nipsey Hussle Square. With additional reporting by Andrew Flanagan. Stream the Celebration of Life in honor of "Neighborhood Nip" — running on a loop — below.